Now, you may ask, “What if I am my business?” Be sure to take advantage of the fact that LinkedIn can classify you as a service provider if you provide a professional service, such as consulting or freelance writing (to name just a few). There are categories and subcategories of service providers that range from computer-related consultants to attorneys, accountants, and real estate agents. Although you can no longer search exclusively for a service provider, your recommendations for any service position still show up in your profile, which can be visible when people search LinkedIn, making it a potentially valuable addition to your business. 1Click the word Profile in the top navigation bar, then click Edit Profile from the menu that appears. From your profile page, scroll down to the Recommendations section and click the Edit link (the pencil icon) to open up that section. You see an expanded view of your recommendations along with the Ask to Be Recommended link on the right side of the screen. 2Click the Ask to Be Recommended link to bring up the Ask for Recommendations page. This step begins the process. 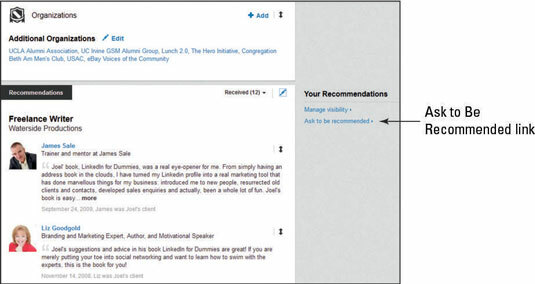 3In the What Do You Want to Be Recommended For section, click the arrow for the drop-down list to find the position you want someone to recommend you for. If you want your Services recommendation to be tied to a specific role, pick one of your positions that indicates that service, such as Freelance Writer or website Designer. If you don’t see an appropriate position in your list, click the Add a Job or School link to add a new position to the Experience section of your profile. 4In the Who Do You Want to Ask section, start typing the names of people to ask for a recommendation. As you type those people’s names, LinkedIn prompts you with the full name of that person. Click that prompt to have LinkedIn add that person to the list. Repeat Step 4 until you add all the people you wish to ask for a recommendation. 5In the Create Your Message section, type a note to send to each person you selected. Although LinkedIn fills in this box with canned text, it’s a good idea to personalize this text. Most importantly, you should use this message to emphasize to the recommender what areas you are hoping they will comment on regarding your service. It’s not about feeding them a speech to say about you, but pointing them to the areas you want mentioned in their recommendation. Make sure the Subject line is appropriate, too, to help your chances of getting your intended requesters to actually open the e-mail and respond. 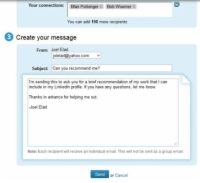 Your request is sent, and your selected connections receive a message from LinkedIn asking them to come to the site and complete a recommendation for you. That’s it! 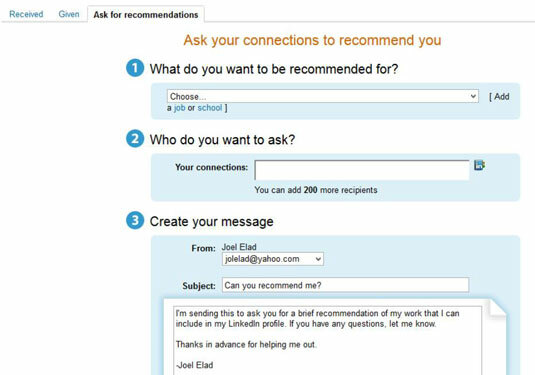 For information on how to complete a recommendation for someone who requests one from you. The best business etiquette involves a combination of online and offline methods, so don’t be afraid to follow up with your recommenders through a phone call, e-mail, or face-to-face interaction after you send the request to make sure you can answer any questions they have and help them complete the process.